My spirulina and baobab smoothie with cinnamon and turmeric may look like something from the bottom of a pond - and part of it is - but it’s jam-packed with healthy ingredients. Spirulina - also known by the less glamorous name of pond scum - is a type of blue-green algae that grows in lakes, rivers and ponds. It is rich in protein and different vitamins and minerals, including calcium, B vitamins and magnesium. 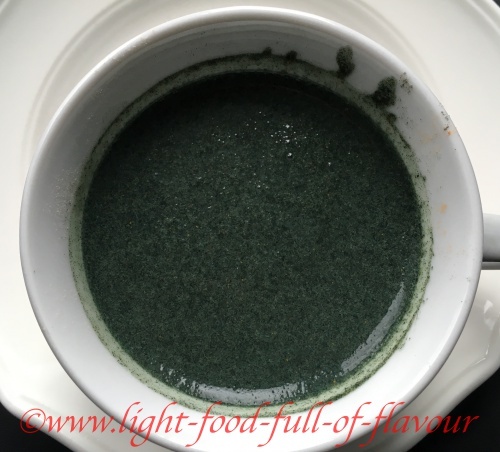 I’ve been adding nutrient-rich baobab powder, real cinnamon and turmeric to yogurt on a daily basis (see Super-Healthy Baobab Fruit) and wanted to see if I could add spirulina as well and still be able to eat it without gagging. While this smoothie might not have the looks, I actually find it surprisingly tasty! I have swapped the yogurt for water and unsweetened soya milk to get a runny smoothie consistency. I finish off the smoothie with added seeds, nuts and chopped banana and end up eating it with a spoon. 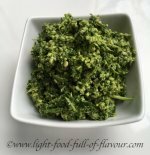 Both the baobab and the type of spirulina I use are in powdered form so I start by adding water and soya milk and whisk it quite vigorously to dissolve the powders. This spirulina and baobab smoothie of mine is part of my drive to age as healthily as possible. There is so my research showing that a lot of diseases that many people think are simply down to genetics and growing older – such as cancer, stroke, heart attacks, arthritis, dementia and Alzheimer’s – are in many cases caused by our lifestyles. And what we eat plays a huge role. Your body needs a lot of different nutrients and it is a good idea to eat a variety of different-coloured vegetables on a daily basis. Essential nutrients all interact with other nutrients and work in synergy – a lot of times one won’t work without the other. To give an example; the balance of calcium in the body is improved by adequate vitamin D intake and calcium and magnesium works together in maintaining both bone density and nerve and muscle impulses. The most common source for calcium in the Western world is dairy food but dairy food is a very poor source for magnesium. A lot of people are deficient in magnesium. You will, on the other, find both calcium and magnesium in dark green leafy vegetables, nuts and seeds. Both baobab and spirulina are rich in calcium and magnesium, as well as many other vitamins and minerals (baobab is also rich in fibre). My combination of the two powders with turmeric, real cinnamon and nuts and seeds makes my spirulina and baobab smoothie a real nutritional feast. Add the baobab, spirulina, real cinnamon, turmeric, water and soya milk to a bowl and use a whisk to mix it all together. Stir in all the seeds, nuts and banana and either use a blender to mix it all together or eat it with a spoon.